Weekly tool, platform and services post. Keeping on with our DIY theme, let’s look at site for musicians, sound technicians, and vocal artists of all kinds. Soundcloud is a place for anyone who has created any kind of sound to upload that audio file to share with the world. And that’s it – it’s like Flickr for audio files instead of photography. Any kind of sound that can be saved digitally and uploaded can be added to Soundcloud: music, singing, sound effects, talking, symphonies, or anything else. Then, it’s available for anyone to listen to and comment on, giving you feedback on how good (or not-so-good) your audio is. If you just want to listen to the sounds already on Soundcloud, all you need to do is visit the site and search for something you might be interested in. You won’t find popular music here, but you will find millions of tracks by independent DJs, sound technicians, sound effects artists, vocalists, and other sound creators. You can search for Tracks, for People, and for Groups. Most likely, you’ll be searching for tracks, and the easiest way to do that is just to type in a few words about what you’re looking for into the search box at the upper right corner. You can also go to the track search page and choose from the advanced search options to be more specific. Use words to describe the style of music (instrumental, vocal, electronic, acoustic), the feeling of the music (downtempo, some number of beats per minute), or other kinds of audio (sound effects, comedy recordings, podcasts). Then click on Search and you’ll get a list of track results. On the site (not in this image), just click on the Play button to listen to the track. At different points, you’ll see comments that other users have added about the music, good and bad. Then you can either search again, click on the track’s creator to hear more by them, or click on one of the tags off to the right for other tracks like this one. If you want, you can also create an account to leave comments, or even upload your own files. For listeners, Soundclound is a free source of all kinds of sound. It’s a great way to discover DJs you enjoy and may want to see live, or for theater and filmmakers to find sound effects for their productions. For sound creators, Soundcloud offers a free and easy-to-use way to share your work out to the world, and help bring together lots of different styles and kinds of sound art in one place. The best place to go is simply the Soundcloud help center. You can search for your questions, look at the existing questions, and even ask a support person for help. This entry was posted in This Week on LLO, Tools and tagged music, sound, soundcloud on October 22, 2012 by Jennifer Koerber. A short but important DIY post this week, LLO readers. This one’s for the fiber artists out there. Ravelry is a social network and online community for fiber artists: knitters, crocheters, designers, spinners, weavers and dyers. Once you set up an account, you can post your projects from pattern to finished piece, and get all sorts of suggestions on yarn, technique, and great resources. You do need to be a member to use Ravelry, but setting up an account takes only a minute or two. Just visit their main page and click on Join now!. Enter your email address and click on Send a signup link. In a few minutes, you’ll receive a link from Ravelry to finish creating your account. Click on the link and then enter all of the information they ask you for. For more information and Ravelry news, check out their blog. My usual answer to this applies – “You can keep everything about your projects in one place, online, accessible at any time from anywhere” – but there’s more to Ravelry than that. Next week on Learning for Life Online, we’ll take a look at some DIY sites for musicians, sound engineers, and special audio effects artists of all sorts. See you then! This entry was posted in This Week on LLO, Tools and tagged crocheting, DIY, finding stuff online, knitting, making things, online communities, ravelry, surprisingly useful tools on October 15, 2012 by Jennifer Koerber. Let’s take another look at a resource we introduced in our Supporting Small Businesses, Online post. Etsy is a crafter’s dream come true, an online craft fair with artists and suppliers from around the world. Everything from handcrafted jewlery to dollhouse miniatures, from custom dresses to funky towels for your bathroom – you can find pretty much anything crafty on Etsy. Etsy was created to help individual artists and crafters sell their work online. Etsy provides the online store and conducts the payment transactions, letting the crafters focus on making their work and shipping it to the people who buy it. Later, sellers started offering supplies like yarn, beads, fabric, patterns, and even vintage pieces for altering. It’s truly a DIY one-stop extravaganza! Use their fun search by color to see items in your favorite shades. Click on a few colors to get going, then click on Organize at the bottom of the page to see the items they suggest. Once you’ve found something you like, read through the notes from the seller to see the details. Sometimes they need measurements to make something custom to your size, sometimes you need to let them know what colors you’d like, sometimes you need to pick and choose from a variety of pieces listed in the same place. Read everything, give them the information they need, and then you can purchase your item and enter your shipping information. The seller will ship directly to you, usually within a week for ready-made items and longer for custom work. Once you’ve gotten your item, you can leave feedback about the seller about how wonderful (or not wonderful) they are. If you’re crafty and want to set up an Etsy shop to sell your stuff, it’s just as easy as setting up an account to buy. You can set up your store for free, then Etsy will charge you fees as you list items for sale and as people use the site to make purchases. You do need to choose what kind of payment you can accept – PayPal and credit card purchases are the easiest for your potential buyers. Etsy isn’t ‘just another place to buy crafts online.’ They are trying to help independent crafters and small businesses of all sorts to be part of the global marketplace, pushing their reach around the world. As Etsy’s About page says, “Etsy is the world’s handmade marketplace. Our mission is to empower people to change the way the global economy works. …We are bringing heart to commerce and making the world more fair, more sustainable, and more fun.” If how and why an item is made is important to you, then Etsy is the place to go. This entry was posted in This Week on LLO, Tools and tagged buylocal, DIY, etsy, everyday things, finding stuff online, online accounts, online buying, online purchasing, online selling, read the screen on October 8, 2012 by Jennifer Koerber. For the month of October, we’ll be looking at DIY – “do it yourself” – tools and resources available online. We’ll start with the biggest and best: MAKE Magazine and Instructables. MAKE Magazine is one of the best online and print magazines for handy folks. Every issue is full of suggestions for projects, from decorative pillows to a LEGO record player. Many projects are practical, and many more are just for fun. Their Halloween issue is good for decorating, snacks, costumes, and more. MAKE also helps to organize MakerFaires around the world. MakerFaires are gatherings of makers and DIY-ers and inventors of all sorts, where you can learn the basics of building a robot, welding, or sewing your own fantastical costumes. If you’re local to Boston, check out MakerFaire Somerville on October 13th, 2012 from 3p – 7p in Union Square, Somerville. It’s a good way to get a taste of makering. Instructables.com is a place where anyone can share their favorite projects and the instructions on how to create it. First, explore the projects already on Instructables, including a recipe for Oreo Nutella Brownie Bites, replacing the vinyl cover on a car armrest, or making rubberband helicopters or a spin art machine! Each project or idea has step by step instructions complete with photos, going through the entire project from start to finish. Then, if you’ve got a project you want to share, read the instructions for uploading and contributing your instructions and photos. No project is too big, too small, too silly, or too easy to share. Everyone needs new ideas and new ways of doing things, including yours. And, of course, Instructables is currently featuring Halloween projects for house and tomb. Next week, we’ll take another look at a few sites we introduced this time last year in the post on supporting small business online. Stay tuned…! This entry was posted in This Week on LLO, Tools and tagged DIY, instructables, MAKE, MakerFaire on October 2, 2012 by Jennifer Koerber. For our last bit of visual fun online, let’s look at two apps that take real-world visual art and turn it into a digital treasure. Art My Kid Made and Artkive are apps for iPhone or iPad (Android coming soon) that let you easily take a picture of a child’s artwork, add information about it, and share it with friends and family. Art moves easily from the refrigerator to the world! There are differences, though. Art My Kid Made instantly shares images to Facebook, Twitter, or Evernote, as well as uploading to its own web page. It also has a simple photo editor that lets you add “stickers,” effects, text, and crop the image to just the best bits. They also feature an “Artist of the Day” on their website and Facebook page. ArtKive makes it easy to keep several kids’ worth of art organized by their first names, and you can create a small Share Circle of email address to send the image to only the people who care most. 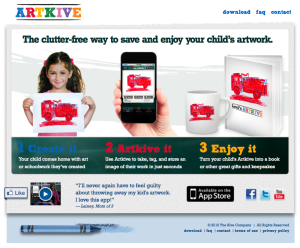 ArtKive will also eventually let you print the artwork as a calendar, on a mug, or as a picture book! If you have children in your life at all, you know that one of the hardest things to do is to organize (or get rid of) the artwork they make at school and at home. It’s all precious, and an important part of their growing up. These two tools help you preserve and organize this part of kids’ lives, and share the art easily with friends and family. If you’re one of those friends and family, you can use either app to help you organize art made by grandchildren, nieces & nephews, cousins, godchildren, children of close friends, students, or any other kids in your life. ArtKive, with its drop-down menu to choose the artist, makes managing multiple accounts a snap. You can also take pictures of more than just drawings and paintings. Capture and share that A+ school assignment, the clay paperweight, an image from a school play or musical recital, or any other moment from a child’s life. Check out the Facebook pages for both apps (in the list below) for more suggestions and ideas. This entry was posted in This Week on LLO, Tools and tagged apps, art my kid made, artkive, artwork, kids, sharing, social networks on September 24, 2012 by Jennifer Koerber. Last week, we looked at Issuu, an online newsstand full of print documents like magazines and reports. This week, let’s take a look at a similar but different idea – creating a magazine or newspaper made up of website and online images and videos. paper.li lets you create an online newspaper from websites, images, videos, or even searches for particular terms and topics. As these sites add new posts or the searches find new results, the links appear as part of your newspaper. You need to use either a Facebook or Twitter account to log in, and then include additional sources of information. Scoop.it is similar, but it’s more of a magazine than a newspaper because it has that glossy look and feel. Also, rather than adding automatic feeds from other places, you pick and choose specific pages, articles, images, or videos to add to your Scoop.it magazine. You can use your Facebook or Twitter account to log in, or create an account just for Scoop.it. For both tools, adding content is as simple as choosing items off a list or copying and pasting URLs. You can create different sections and add your own notes and articles. Other people subscribe to your online newspaper or magazine and as it gets updated, they see new content and information. You can also add your paper.li or Scoop.it feed to a blog or website so that visitors can see the content you’ve curated. Just like Issuu, paper.li and Scoop.it allow anyone to create an online resource for a specific group of interested readers. With a print newspaper or magazine, you need to be able to see a large number of subscriptions to make it cost-effective. Using online tools, you can easily put together a publication for just a handful of readers who are all passionate about a particular topic. For example, an editor named Tollcraft curates a paper.li newspaper for crafters in Tollcross and Edinburgh, Scotland. The news might be from anywhere in the world, or from right in their own neighborhood. Meanwhile, Public Relations News curated by Lee Odden is for anyone in the world who’s interested in PR or marketing. In all of these cases, it’s the fact that real humans are curating this content – picking and choosing what gets included – that makes it most useful. Someone decided that particular websites, images, videos, or other links were relevant to a particular topic and put them all in one place. This aggregation and content curation are a way for people who don’t necessarily want to create content to be able to share other useful content instead. You don’t need to create an account with either paper.li or Scoop.it to read the content that other people have created. Just visit the paper.li newsstand or browse topics in Scoop.it, click on something that looks interesting, and enjoy yourself. You can also use the search boxes at the top of each screen to find topics that are important to you. This entry was posted in This Week on LLO, Tools and tagged content curation, newspapers, paper.li, scoop.it, social news, visual tools on September 17, 2012 by Jennifer Koerber. For the month of September, we’re going to focus on some great visual resources in online life. Let’s start with something familiar: an online newsstand bursting with full-color publications. Issuu is site that features thousands of online magazines, catalog, conference reports and more. Professional-quality digital publications are available to read online, in full color, on a computer or mobile device. It’s free, easy to use, and many of the publications are gorgeous. It’s easier to show you what Issuu is like than tell you, so click through on an example below to see it in action. In addition to finding digital publications, Issuu is also a place where anyone can upload and show off their own visual document. All you need to do is create an account and then upload your finished document to Issuu. Share the URL for that document in email, on a blog, or from a social media account, and everyone will be able to see it quickly and easily. Read more about how Issuu works, watch a video, or just give it a try. Like most of the tools we examine, Issuu is most useful because it takes a document or publication and makes it available to anyone with an internet connection, wherever they are. In addition, Issuu highlights new and popular publications each month, making it easier for other people to find the most interesting titles. Issuu’s search isn’t the best, but it does organize things by category and popularity as well as by how new it is. If you just want to browse Issuu and see what other people have done, start at the home page and click on a featured title. You can also start at the publications page, then: Use the search box at the top to look for a particular topic, choose the language you want or the type of document you’re looking for to get more specific results, and use the facets down the side to browse by subject. This entry was posted in This Week on LLO, Tools and tagged issuu, issuu.com, online publishing, visual tools on September 10, 2012 by Jennifer Koerber. 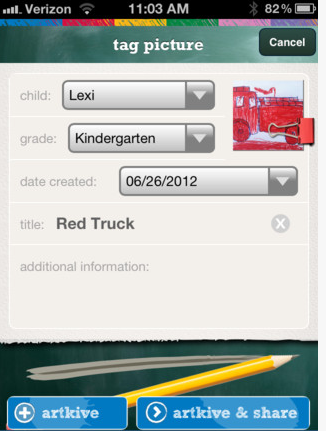 One obvious way to use online tools for school and study is to help keep things organized. There are different tools that will keep track of your to do lists for you, but they all have the same basic features. You can create specific tasks, organize them into lists or projects, set due dates for each task, and view these tasks in a single agenda or project-by-project. Some tools can do more, like send you notifications of tasks as they are due, or give you a mobile app for your smartphone to use wherever you go. When you write out your to do lists on pieces of paper or on a calendar on the wall at home, it’s easy to lose track of updating the list or remembering what was due when. Using an online task organizer, you can keep that list in one place and get to it wherever you can connect to the web. If you have a smartphone or tablet, it’s even easier. Just like all of the online account or online collaboration tools we’ve looked at, it’s about keeping things in one easily-accessible place and not having lots of information in different spots. If you have an online account with Google, Yahoo! or Hotmail/WindowsLive, use the help below to create a basic to do list and try organizing just one project to start with. It might be a class you’re taking, a report you’re writing, or even a project at home. Don’t try to organize everything all at once – start with something simple and add projects as you get the hang of it. For a little more organization, or if you don’t have an online account, give one of other tools a try. Remember the Milk and Todoist are the simplest to use, but all of them are good for different kinds of projects. Look at the lists of features and see what works for you. ToodleDo has a list comparing the major task managers. They only compare the free versions, however, so make sure to look at the features available with upgrades to Remember the Milk and Todoist. This entry was posted in This Week on LLO, Tools and tagged collaborative planning, collaborative work, gmail, google calendar, hotmail, online accounts, remember the milk, todoist, toodledo, vitalist, windows live, yahoo on August 20, 2012 by Jennifer Koerber. As folks head back to school, let’s spend the rest of August finding ways to study and learn from wherever you are: still on vacation, away in a dorm room, or hanging out at recess. Watching TED talks is fun, but sometimes you need a little more structure. After more than ten years of colleges and universities offering some kind of online access to courses for their students, today anyone can find lectures, courses, and more available online – some for free, some for a reasonable fee. Here’s a few to give you an idea of what’s out there. Wikiversity was created by the same people who started Wikpiedia. Educators and experts worldwide offer free educational resources and courses on hundreds of topics. Several universities are offering online courses that you can explore at your own pace, or take with a registered class of other students. Check out what’s available from MIT’s OpenCourseware project, Stanford’s Free Online Courses, Open Yale Courses, and Harvard’s Open Learning Courses. Imagine searching for lectures as easily as you look for the latest pop hits? That’s the premise behind iTunesU. If you have iTunes on your computer, open it up and click on the iTunes Store, then iTunes U up at the top. Search for a subject you’re interested in and then subscribe to listen or watch it. Looking to learn more about computer programs you need for work or school? Try Lynda.com, a resource for online training tutorials. For a monthly or annual subscription, you have access to nearly 1500 tutorials on everything from Microsoft Word to Adobe Photoshop and more. Many colleges and universities offer formal distance-learning programs, but the University of Phoenix has one of the most well-known online degree programs. The Museum of Modern Art in New York offers art courses online, both self-study and instructor-led. Discover art from MoMA from wherever you are! World-class education, for free, from whatever computer or mobile device you have that can get to the internet. Learn at your own pace, on whatever subject you like, whenever you have time, wherever you are. How isn’t this useful? Take a look at a class from any of the resources above and listen to a recorded lecture, read through the notes, or watch a video. Expand your mind and get back in gear for learning. This entry was posted in Resources, This Week on LLO, Tools and tagged edX open education initiative, harvard open courses, itunes u, lynda.com, MIT opencourseware, MoMA online courses, online learning, online lectures, stanford online courses, university of phoenix, wikiversity, yale open courses on August 13, 2012 by Jennifer Koerber. 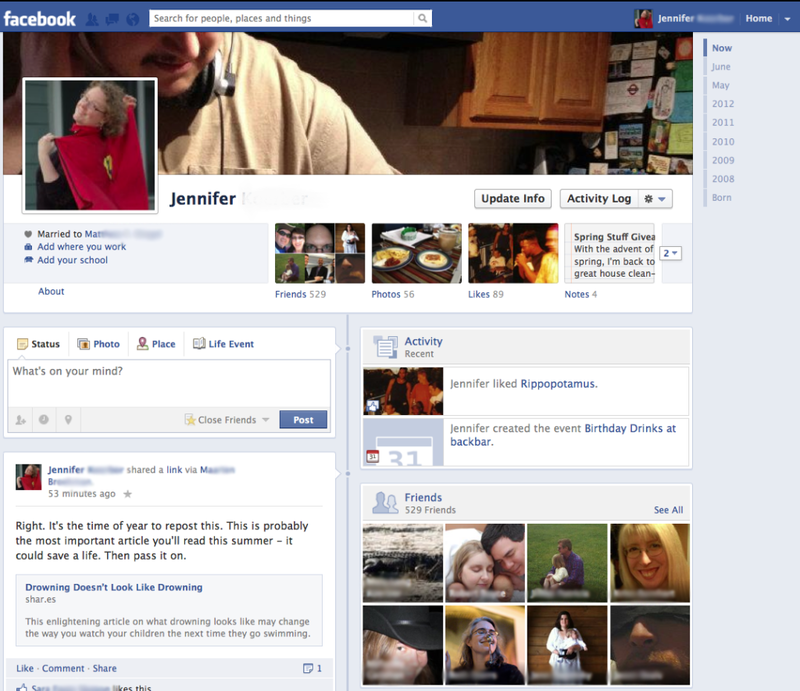 Facebook Timeline…once more, with feeling! Good morning. Over the weekend, many Facebook users were told that as of August 4th, their profile pages would be switching to the new Timeline format. Let’s take a look at Timeline’s features and see how you can prepare for the big switch. The major updates with Timeline are a new look for your own information and your Wall and an easier way to navigate a person’s history of posts in Facebook. New layout. In Timeline, there’s a Cover photo up at the top (just like on many websites), your information underneath, and then your posts down below. On a laptop or desktop computer, you’ll see two columns of posts. On a mobile device (smartphone or tablet), you’ll just see one. The stories scroll down the page in reverse chronological order – newest first and older as you go. Timeline to get to older posts. One of the big problems with the old profile page is that you could only go back a few dozen posts at a time. There was no way to see what you or someone else had written last month, last year, or back when you started on Facebook. 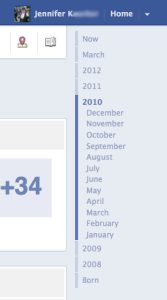 Now, there’s a ‘timeline’ off to the upper right – just click on a year or month to look at posts from that time. Cover photo. This image should be a large-ish, interesting picture either taken by you, of you, or is of something important to you. It’s the first thing people will see when they look at your Timeline, and you can have fun with it. Later this week, we’ll be adding a separate post on uploading photos to Facebook, to walk you through the process of adding a Cover photo. New kinds of updates. 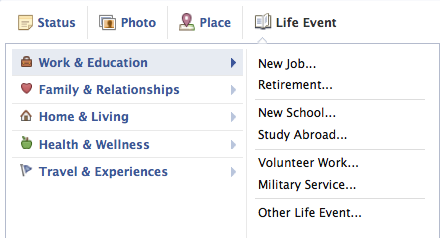 From your timeline, you can add different Life Events and use Facebook as a true online documentary of your life. Change settings easily. Watch what happens when you put your cursor over things on the screen. There are a lot of settings hidden in plain sight on Facebook pages. Put your cursor over text, images, and empty boxes on the page and wait a moment – a box with an X, a small gear, or some text might appear on the right to offer you choices. Click on them to see what your choices are. Edit link previews. When you post a link, Facebook automatically creates the link and adds an image if there is one. Remove the image by clicking the box next to No Thumbnail. Change the description by clicking on the text until it turns yellow, then delete or type until it says what you want it to. Unfollow posts. If you’re tired of getting notifications for new comments on a post you’ve commented on, Unfollow it. Up at the top left, click on the globe icon and put your cursor over the latest notification for that post. Click on the X that appears in the box, and then click on Unfollow. Create lists of friends. Now you can create different lists of friends, so you can easily choose which people can see which posts. Make a “Close Friends” list for the people you know well, add your parents and cousins to “Family,” and keep your “Work Friends” separate. You can also click on the list name under Friends on the left side of your News Feed page to just view posts by those people. Facebook has been moving users to the new Timeline for a few months now, and many people have said they don’t like it. Some don’t like the layout, some think it’s slow to load, some think it’s just broken. Some people don’t like the fact that it’s easier to get to older posts, and some don’t like all the ‘extra work’ they think the new layout makes them do. Remember that it only affects your personal page. Your news feed page will stay just the same. See what Timeline does really well, and what your News Feed page does well. Ask yourself if it might be okay for one to work one way and the other, another? In the comments or on the Learning for Life Online Facebook page, tell me what you think of Timeline. Good or bad – we want to know. This entry was posted in Basics, This Week on LLO, Tools and tagged facebook, facebook timeline, settings, surprisingly useful tools on July 30, 2012 by Jennifer Koerber.